I've been participating in a tea forum with a group of lovely ladies for quite a few years. Our group, Afternoon Tea Across America, 'meets' on Facebook and shares information and tidbits about tea. 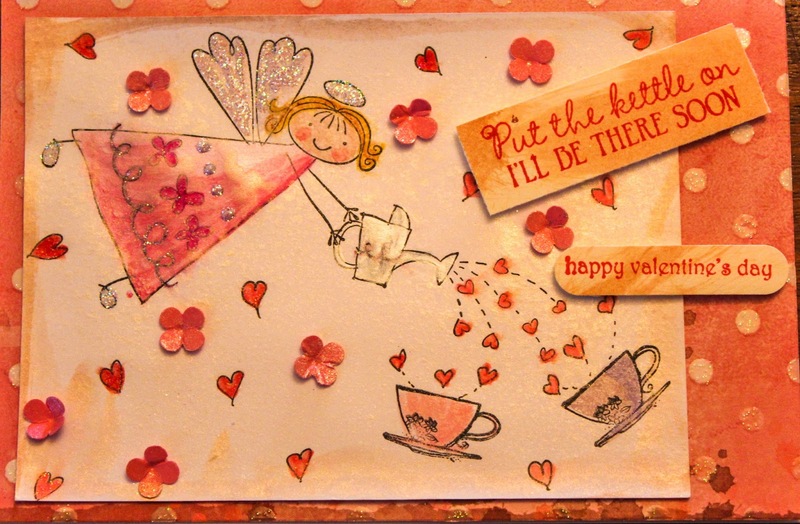 For Valentine's Day, we have decided to have a card and tea swap. Of course, I had to MAKE my cards as that's half the fun of it for me. 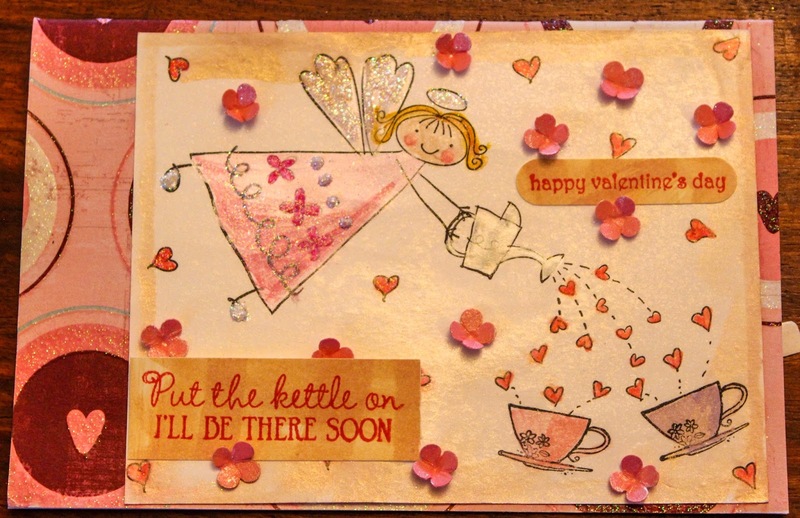 In addition to making the card, I also used a die and embossing folder to create heart-shaped tea bags using coffee filters. These were filled with loose-leaf tea and sewn up to seal. I then created die-cut pouches to hold the tea, too. I will post those photos later. 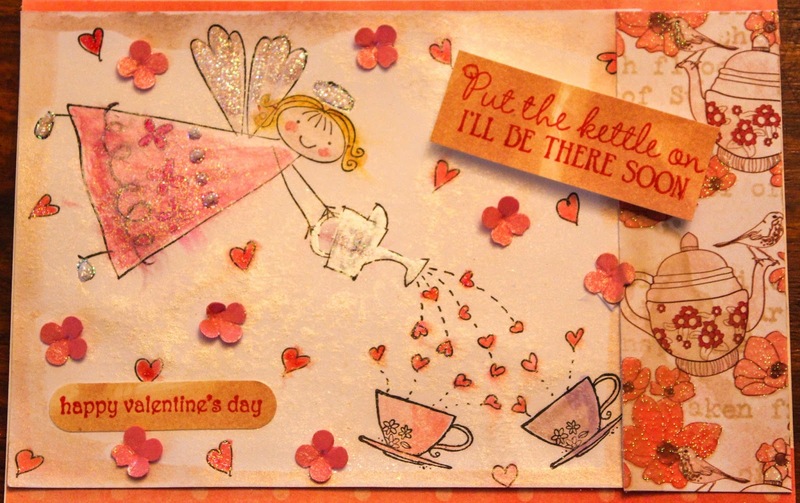 This Valetine's Day card features Stampin' Up's 'If the Halo Fits' and 'Morning Cup'. In addition, the sentiments come from SU's 'Teeny Tiny Sentiments' and Waltzing Mouse. I used both Twinkling H2Os and Stampin' Up markers for coloring and shading. You can see that lots of SU Dazzling Diamond glitter was liberally applied. I am a glitter gal! To create a more vintage appearance, I sprayed Perfect Pearls Mists in Biscotti for antique luster. Even the little punched pink flowers were sprayed with Perfect Pearls. Tim Holtz distress inks were used on edges and sentiments to add to the vintage feel. A few hand-drawn hearts were spread around the design. StazOn Jet Black, which is waterproof, was used for stamping the images.